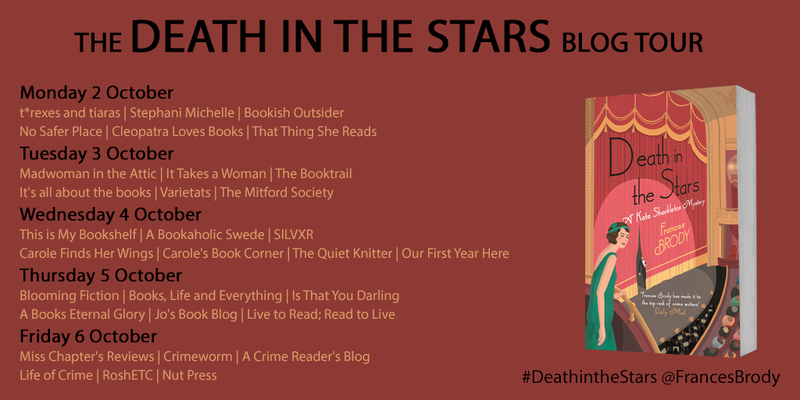 Death in the Stars is the 9th novel in the very popular mystery series featuring amateur sleuth Kate Shackleton. I've read most of them and have loved every one! Set in Yorkshire they evoke a real feel of the 1920's, of a slower pace of life, when ladies were treated as fragile beings. But Kate's no shrinking violet, she's tough and clever, and has a mind of her own, even starting up her own detective agency with an ex-policeman to assist her, as well as her housekeeper Mrs. Sugden. This time, she's in the company of theatre folk, in particular 'The Silver Songbird' Selena Fellini who enlists Kate's help when she's invited to a private gathering to watch the eclipse. After the death of fellow performer Billy in suspicious circumstances during the eclipse, Kate's naturally curious nature doesn't believe it was an accident. Frances Brody's attention to detail really make her stories stand out - who knew that there were traffic jams in 1927 as people were anxious to get a good view of the eclipse! Her characters are so believable and real and the plots are so unique and carefully thought out. 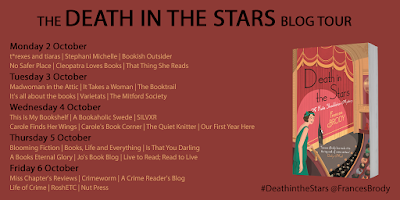 I loved following Kate's thought processes as she tried to discover not only who murdered Billy but if there is a serial killer in the theatre's midst. This was a time when some of the old performers days were numbered, as talking pictures and gramophone records were gaining in popularity. Brilliant storytelling, gripping from the first page to the last, I particularly enjoyed the relationship between Kate and her assistants Mr. Sykes and Mrs. Sugden who all work so well together. If you haven't yet caught up with this series I urge you to check them out. I can't wait for the next Kate Shackleton adventure! 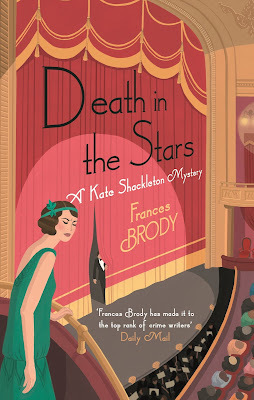 Death in the Stars is published by Harper Collins on 5 October 2017.